Data are for households and non-profits, which the Federal Reserve reports in the aggregate. Financial assets in red. Real estate assets in green. 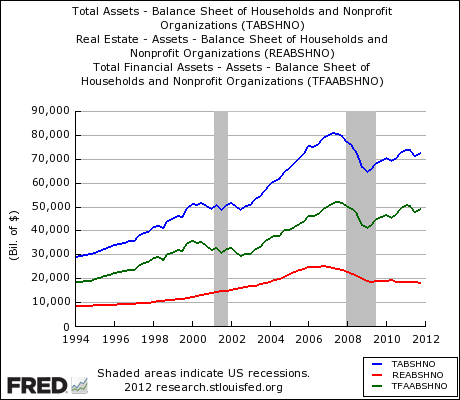 Total of real estate and financial assets in blue. This entry was posted on Monday, March 12th, 2012 at 2:20 PM and is filed under Interesting Charts. You can follow any responses to this entry through the RSS 2.0 feed. Both comments and pings are currently closed.